SKU: 20123012. Category: Commemorative, Other. 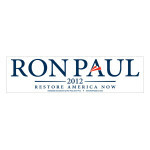 The Ron Paul 2012 Presidential Campaign Official 2.25″ metallic pin-on Red Button! The attractive design and bright color really stand out on this must-have classic campaign button.